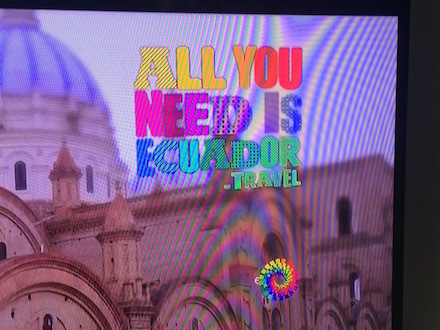 I was watching television this afternoon when I saw the most interesting domain name I have seen in a long time: AllYouNeedIsEcuador.Travel. Yes, that is a 5 word .Travel domain name being advertised by Ecuador’s Ministry of Tourism (Ministerio de Turismo del Ecuador). When you visit AllYouNeedIsEcuador.Travel, you are automatically forwarded to the Ecuador.Travel website. This website has a ton of information about Ecuador and visiting Ecuador. I have never been to Ecuador, but the Galapagos Islands are on my list of places to visit in the near future. Good opportunity to reiterate the truth about long domains. Long domains can be and often are valuable, sometimes just as valuable and sometimes even more valuable than short domains. The “rule” about short domains is an unfortunate fallacy in need of modification and revision. We are all losing a lot of money because of the unnecessary tunnel vision, bias, vanity, and elitism in the other direction, and have been for years. I’ve said it before and I’ll say it again: I’m primarily an end user and only secondarily a seller of domains. As an end user, I’ve seen it myself firsthand: even if you have a valuable four word domain or more as long as a stretch limo (e.g. ExampleExampleExampleExample.com), visitors will not only literally search for such a long domain itself to get to your site, but will even search for it in numerous ways such as merely adding spaces along with the “.com” ending (e.g. Example Example Example Example.com). When Google used to reveal those searches by which visitors would come to your site, I used to see it all the time, time after time, in the traffic logs. How many people who are just “domain investors” and “domainers” but not end-user publishers can even say that or have that perspective? The bottom line is that normal people are perfectly happy with long domains that are strong and make sense. I thought all you need is love. Loveisallyou.need Interesting find. Very interesting long tail. Nice write up. I know that some companies use long tails to identify incoming traffic sources to shorter domains, or more branded domains. A couple of the incessant attorney commercials on tv seem to do that a lot; presumably to track the effectiveness of certain advertising slots/demographics. It would be nice to be a fly on the wall of the breadth of “incoming” urls they use, and which type are more effective on any one of these sites that use these strategies. Maybe the travel bureau would be interested in my EcuadorIslands.com, which I haven’t gotten around to developing yet, other than a template, so far.